The small form-factor pluggable (SFP) is a compact, hot-pluggable optical module transceiver used for both telecommunication and data communications applications. The form factor and electrical interface are specified by a multi-source agreement (MSA) under the auspices of the Small Form Factor Committee.It is a popular industry format jointly developed and supported by many network component vendors. An SFP interface on networking hardware provides the device with a modular interface that the user can easily adapt to various fiber optic and copper networking standards. SFP transceivers exist supporting SONET, gigabit Ethernet, Fibre Channel, and other communications standards. Due to its smaller size, the SFP has replaced the gigabit interface converter (GBIC) in most applications; the SFP is sometimes referred to as a Mini-GBIC. In fact, no device with this name has ever been officially defined in the MSAs. SX+/MX/LSX (various manufacture names) – 1310 nm, for a distance up to 2 km. Not compatible with SX or 100BASE-FX. Based on LX but engineered to work with a multi-mode fiber using a standard multi-mode patch cable rather than a mode-conditioning cable commonly used to adapt LX to multi-mode. 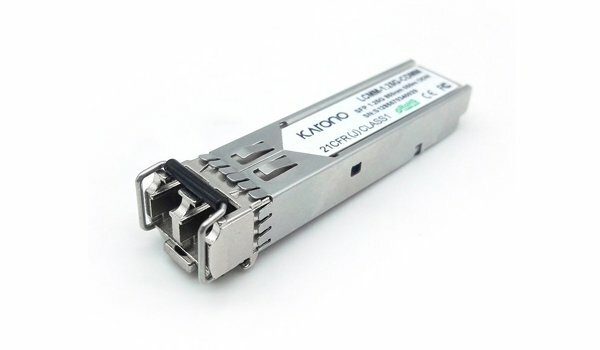 BX (officially BX10) – 1490 nm/1310 nm, Single Fiber Bi-Directional Gigabit SFP Transceivers, paired as BX-U and BX-D for Uplink and Downlink respectively, also for distances up to 10 km. Variations of bidirectional SFPs are also manufactured which use 1550 nm in one direction, and higher transmit power versions with link length capabilities up to 80 km. SFSW – Single Fiber Single Wavelength transceivers, for bi-directional traffic on a single fiber. Coupled with CWDM, these double the traffic density of fiber links. 1000BASE-T – these modules incorporate significant interface circuitry for Physical Coding Sublayer recoding and can only be used for gigabit Ethernet because of the specific line code. They are not compatible with (or rather: do not have equivalents for) Fiber channel or SONET. 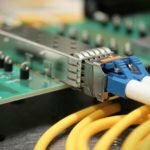 Unlike non-SFP, copper 1000BASE-T ports integrated into most routers and switches, 1000BASE-T SFPs usually cannot operate at 100BASE-TX speeds. 100 Mbit/s copper and optical – some vendors have shipped 100 Mbit/s limited SFPs for fiber to the home applications and drop-in replacement of legacy 100BASE-FX circuits. These are relatively uncommon and can be easily confused with 1 Gbit/s SFPs. The enhanced small form-factor pluggable (SFP+) is an enhanced version of the SFP that supports data rates up to 16 Gbit/s. The SFP+ specification was first published on May 9, 2006, and version 4.1 published on July 6, 2009. SFP+ supports 8 Gbit/s Fibre Channel, 10 Gigabit Ethernet and Optical Transport Network standard OTU2. It is a popular industry format supported by many network component vendors. 10 Gbit/s SFP+ modules are exactly the same dimensions as regular SFPs, allowing the equipment manufacturer to re-use existing physical designs for 24 and 48-port switches and modular linecards. Although the SFP+ standard does not include mention of 16G Fibre Channel it can be used at this speed. Besides the data rate, the big difference between 8G Fibre Channel and 16G Fibre Channel is the encoding method. 64b/66b encoding used for 16G is a more efficient encoding mechanism than 8b/10b used for 8G, and allows for the data rate to double without doubling the line rate. The result is the 14.025 Gbit/s line rate for 16G Fibre Channel. In comparison to earlier XENPAK or XFP modules, SFP+ modules leave more circuitry to be implemented on the host board instead of inside the module. Through the use of an active electronic adapter, SFP+ modules may be used in older equipment with XENPAK ports. SFP+ modules can be described as ‘limiting’ or ‘linear’ types; this describes the functionality of the inbuilt electronics. Limiting SFP+ modules include a signal amplifier to re-shape the (degraded) received signal whereas linear ones do not. Linear modules are mainly used with the low bandwidth standards such as 10GBASE–LRM; otherwise, limiting modules are preferred. 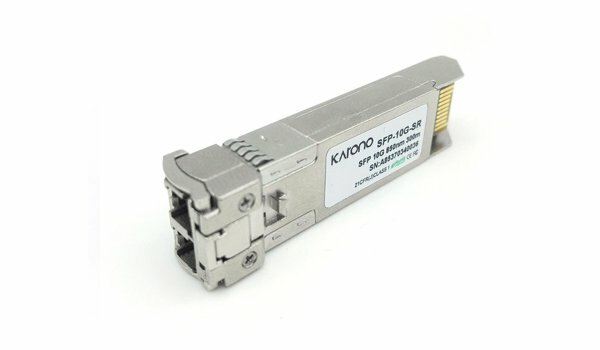 SFP+ also introduces Direct Attach for connecting two SFP+ ports without dedicated transceivers. SFP28 is a 25 Gbit/s interface which has evolved from 100 Gigabit Ethernet, which is typically implemented with 4 × 25 Gbit/s data lanes. Identical in mechanical dimensions to SFP and SFP+, SFP28 implements one 28 Gbit/s lane(25 Gbit/s + error correction) for top-of-rack switch to server connectivity. SFP28 may also be used to “break out” a single 100GbE port in a top-of-rack switch into four 25 Gbit/s individual server connections. SFP28 functions with both optical and copper interconnects. For very short distances of 5 meters or less, as with 10 Gbit/s SFP+ “direct attach” cables, passive copper SFP28 modules integrate cable and transceivers into a single fixed-configuration module. 25 Gbit/s interfaces are also implemented using the QSFP transceiver form factor. Direct attach cables, 1 to 5 meters in length. 850 nm SR using two strands of multimode fiber, distances up to 100 meters on OM4 grade multimode cable. 1310 nm LR using two strands of singlemode fiber, distances from 5 to 20 km depending on optical link budget.